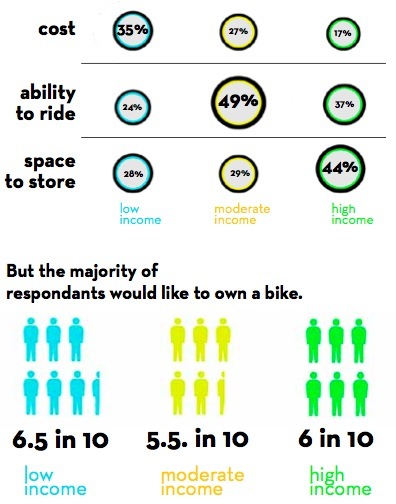 A survey conducted by Lower East Side coalition Local Spokes found a widespread desire to own bikes but significant obstacles that need to be addressed. After a year and a half of grassroots activism, last week the Lower East Side’s Local Spokes coalition released a wide-ranging action plan to improve cycling in the neighborhood [PDF]. The plan includes both actions that Local Spokes member organizations plan to undertake, like developing a bicycle safety curriculum for area residents and organizing businesses to provide bike parking, and those they intend to lobby the city for, such as more bike-share stations and better bike parking in NYCHA buildings. The Local Spokes coalition includes some of the neighborhood’s deep-rooted community organizations, like Asian Americans for Equality and Good Old Lower East Side, as well as issue-focused groups like Transportation Alternatives. Together, they developed a plan to improve conditions for cycling in the neighborhood based on sustained grassroots organizing, including a 1,200 person survey, eight public visioning meetings and a team of youth ambassadors who combed the neighborhood. Based on Local Spokes’ research, there’s substantial latent demand for cycling among low-income residents of the economically diverse neighborhood. Low-income residents possessed bikes at a lower rate than others surveyed by the coalition, but expressed more interest in bike ownership than any other group. They also lived farther from transit stops. Cost, ability to ride safely, and storage space were all identified as obstacles to owning bikes. To help would-be cyclists get around the neighborhood more easily, the coalition has a slew of recommendations. On each issue, they’re also willing to put some skin in the game. Local Spokes wants the city to increase the number of bike racks in the neighborhood by 20 percent, for example, and include up to five new on-street bike corrals — and they promise to find the bike-friendly businesses needed to maintain those corrals. Similarly, Local Spokes calls for more bike-share stations to be located along the East River waterfront, where transit is furthest and incomes are lowest. At the same time, the coalition volunteers to provide multi-lingual bike-share outreach as the system rolls out. The report is filled with solid, neighborhood-specific suggestions. It urges one NYCHA development to pilot the creation of an indoor bike parking facility, important in a neighborhood often starved for space. On the other side of the commute, Local Spokes calls on the city to implement the Department of City Planning’s suggestions for improving bike/transit connections with parking around subway stations. “By working locally, welcoming complexity, and allowing for a process to be led by the readiness of a community, Local Spokes has created a model that demonstrates just how efficient and effective community driven change-making can be,” said Pasqualina Azzarello, the executive director of coalition member Recycle-a-Bicycle. Other topics covered include traffic enforcement, wayfinding signs, and public bike repairs. For the most dangerous streets in the neighborhood, like the Bowery and Houston Street, the coalition suggests that working groups be formed similar to the one that advocated for and won Delancey Street safety improvements. Le said that local elected officials were “pretty supportive” as Local Spokes developed its plan. The coalition is now returning to those politicians with the completed proposal. This is an impressive excercise in community coalition work. I think, given the density of the Lower East Side, that the many excellent suggestions put forth in thre report will, if enacted, result in a tremendous boost to cycling in the neighborhood. Bike share will boost it further still.